Plant growth requires a compatible relationship between the plant, the atmosphere, and the soil. The soil will provide a location, support, foundation, and nutrients for plant growth. The air provides some needed elements and eventually the dead plants return materials to the soil. Over 50 different factors enter into the relationship. Some cannot be modified very much, like relative humidity, but many, like soil texture, can be juggled by a producer. Profitable production is the result of careful juggling. One of the key factors that can be manipulated is nutrition supplied by elements. Twenty elements are considered essential for plant growth because they are involved in metabolic functions required in the life cycle of the plant. Some, like carbon (C), oxygen (O), and hydrogen (H), can come from the air. Nitrogen (N) is made available to the plant from the air and soil. But most of the needed elements that are nutrients for plants come from the soil. They are not all equally important but all play a role in plant growth. Most needed are nitrogen (N), phosphorus (P), potassium (K), and sulphur (S). The others are calcium (Ca), iron (Fe), magnesium (Mg), manganese (Mn), zinc (Zn), copper (Cu), boron (B), molybdenum (Mo), chlorine (Cl), sodium (Na), cobalt (Co), nickel (Ni), and silicon (Si). They will be discussed in the next objective. To remember all the twenty elements, some memorize the phrase: "C Hopkins cafe, mighty good mob comes in". Nitrogen is the most critical element for grass plants because it is often deficient and yields obvious benefits. 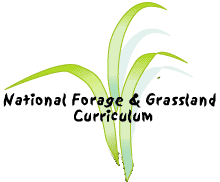 N fertilization on forages generally increases yield and crude protein content of cool and warm-season grasses. Stored carbohydrates are reduced, which produces a more succulent plant. Plants normally contain between 1 and 5% N, absorbed as nitrate (NO3-), ammonium (NH4+) ions and urea. Nitrate is most often available but must be reduced to NH4+ or NH3 for plant utilization. Too much nitrogen may result in animal disorders related to high nitrate, alkaloid content, or hypomagnesemia. Some plants also are more susceptible to lodging, disease, or insect invasion. Legumes, however, can fix their own nitrogen from the atmosphere. Nitrogen application is not recommended for legumes. Adding nitrogen decreases the nodulation on legume roots and the amount of N fixed by the plants. There is no yield increase of tissue nitrogen percentage when legumes are properly inoculated. Legumes usually require more K, S, Mo and B than grasses. Since the nutrient needs of grasses and legumes differ, use fertilizers to manage a grass/legume mixture. Adding K, S, Mo, and B will favor legume growth. Grasses crowding out legumes or the invasion of weedy species may indicate decreasing levels of K. K has shown to increase stand longevity in addition to yield and quality. When managing a mixed sward, fertilization can do more than just increase yield. Remember the differences between grasses and legumes. Determine which species are desired as dominant in a mixture. What kind of mixture best meets the animal requirements? Do other limitations determined by geophysical factors (soil, weather, elevation) favor grasses or legumes? Phosphorus (P) makes up about 0.1 and 0.4% of a plant and is involved in energy storage and transfer, root growth, early maturation, quality, and disease resistance. Plants absorb H2PO4- or HPO42- orthophosphate ions. Potassium (K) concentration in vegetative tissue usually ranges from 1 to 4% of dry matter. Plants absorb N and P in compounds but the K+ ion is absorbed as K+. K influences enzyme activity, water and energy relations, transpiration and translocation, and N uptake and protein synthesis. Sulphur (S) is absorbed by plant roots as a sulfate ion SO42-. Plants can be dusted with elemental S. Normally, S concentrations range between 0.1 and 0.4%. Deficiencies in S result in retarded growth: stunted, thin-stemmed, and spindly plants. Some confuse a S deficiency with a shortage of N because of growth problems. Sulphur problems show up first in younger leaves while N problems show up first in older leaves. S is crucial to proper plant amino acid functioning. There are a few ways to determine what nutrients are needed: soil test, plant tissue analysis, yield response, and crop removal. Yield response and crop removal take careful observation and a long time period. Plant tissue analysis is a good way to determine how much of a nutrient is being absorbed by the plants and therefore depleted from the soil. Determining what has been removed by analyzing the crop yield is a way of determining what should be replaced. Plant tissue analysis (hotlink to an example) can provide valuable information but replacement of nutrients should also consider leaching and other losses. Calculating the pounds of nutrients removed from dry matter yield involves a simple equation. Multiply the average tissue concentration (determined by tissue analysis) for the specific element (usually N, P, K, and S) by the dry matter yield in pounds per acre. If the average tissue concentration for K is 1.85% and the dry matter yield of a hay crop is 8 tons, put the percentage in decimal form and the 8 tons into pounds, each ton is 2000 pounds (907 kilograms): .0185 X 16000 pounds (7257.5 kilograms) = 296 pounds (134.3 kilograms) of K removed. A soil test is the best way to know if the soil can provide these elements to plants. A soil test is a chemical method of estimating the capacity of the soil to supply nutrients. Taken every 4 years to monitor soil acidity and fertility, a soil test can be a very helpful tool before forages are planted. Soil tests determine what nutrients are in the soil; not the plant uptake, which can be measured by plant analysis. Technology is developing more accurate ways of soil sampling resulting in efficient, environmental-minded, and scientifically sound fertilizer application. But the basic guidelines include several highlights. Soil test samples should be taken every 2.5 - 5 acres (1-2 hectares) and in areas of different geophysical features (hillsides, soil types, areas managed differently) to represent the entire field, but should avoid small unusual spots. Dig out a sample of soil from plow depth unless a shallower height is needed as in cases of renovation. Avoid contaminating sampling tools with fertilizer or soils from other spots. Do not use galvanized, brass, or bronze tools when planning to request information on micronutrients such as zinc. Place the collection of samples into a clean container and mix thoroughly. Fill a sample bag with soil and fill out needed information. Do not use paper bags for the composite sample. Each sample should be about 1 pint of soil consisting of subsamples taken from 15-20 locations. Record information about the samples and locations. Keep a map of soil sampling over the years to develop a real sense of the soil history and potential fertilizer application. Label them before sending them to a soil testing service. Request what tests you want performed since each test costs money. Soil Testing Results: If results show a pH too low for optimal production of the intended forage, lime may be a wise investment.